Premier League Kicks is a national programme that The Huddersfield Town Foundation deliver in partnership with the Premier League. The programme provides free weekly sports and physical activity opportunities for young people aged between 8 – 19 years. 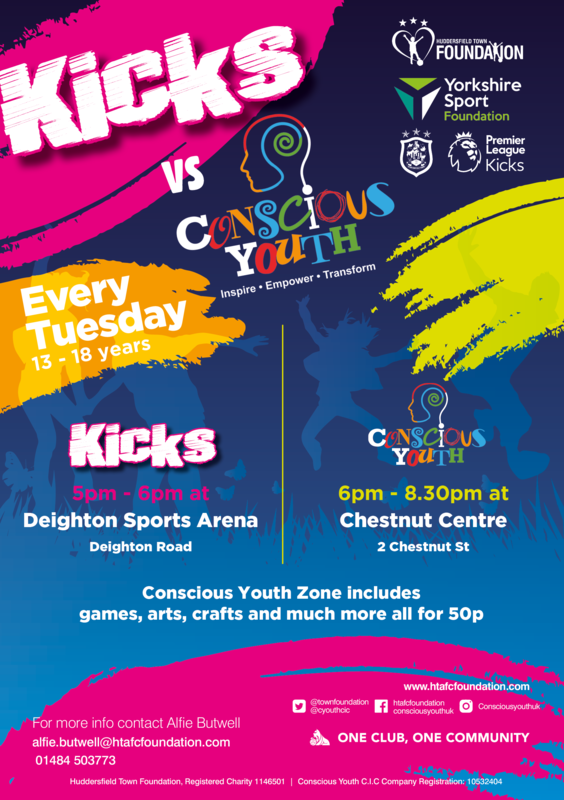 In partnership with local youth work focused organisation, Conscious Youth CIC we have launched our first pop up Youth Zone, Kicks vs Conscious Youth for young people aged 13 – 18 years. The Youth Zone provides a fun, safe and accessible environment for young people to socialise and experience new challenges. The Youth Zone is equipped with the usual youth club gaming activities. It has been created in partnership as a place to facilitate a whole range of other activities such as health; wellbeing and education workshops; support; mentoring; social action and community cohesion projects and fitness. The programme is varied and includes sports; music; group discussion; table top games; workshops; community involvement and participation in wider youth led projects. As part of our youth engagement programmes, we encourage young people to volunteer which in turn supports them in gaining skills, experience and confidence which they can apply to further themselves through their chosen pathways. Volunteers are given the opportunity to complete a variety of different training courses that support our programmes. These include leadership qualifications and national governing body accredited coaching qualifications. For more information about any of our youth engagement programmes and how you can get involved, please get in contact via the contact page.